The first step in doing makeup (at least for me) is having a flawless face to work with. Perfecting the base is something I take time doing, especially with clients I do makeup for. I always have this notion, where in the face, works like a canvass when it comes to makeup. I know it is cliché to say that, as a lot of people who do makeup think of it that way. But that statement is as clear as saying that one needs a flawless face to work with in order to achieve perfection in applying makeup. Great bases help attain that, which is why I started investing with good ones to help build a decent kit for clients. Ben Nye is a theatrical makeup company - by means of that, it is a heavy duty makeup made to withstand the harsh lights of the industry. It started in 1967 by a famous Hollywood makeup artist; Benjamin Emmet Nye Sr., who was renowned for decades (yes decades) in the said field. A few movies I am familiar with, regarding his work would be Gone With the Wind and Planet of the Apes. Enough with the trivia, I know you want the review so here it goes. 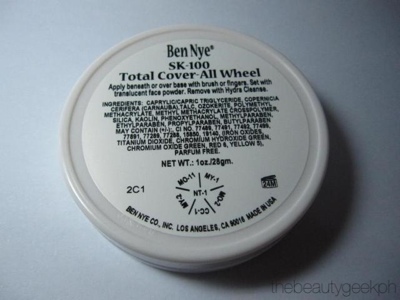 The Ben Nye Total Cover-all Wheel in SK-100 is a concealer wheel divided into 6 portions. Although, you may purchase the shades individually, I find it more economical to buy the cover wheel as you get 6 shades for the price of 3. 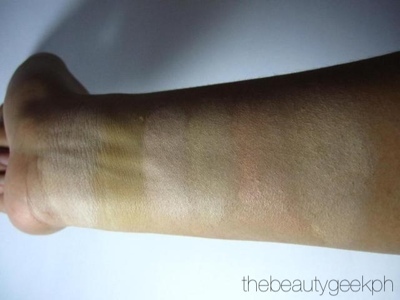 It is a cream based concealer with superb pigmentation. It offers great coverage without making it look thick - it is blendable (I know it is not even a word but you girls get me with that right?) enough to make your makeup look natural and at the same time it has the ability to hide those unwanted marks that you wish to conceal. I tried using this on a birthmark and it covered well. 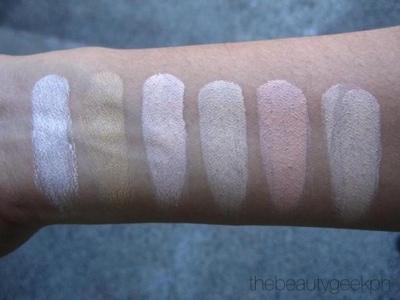 And since it is blends well, you can mix different shades to match the shade of the skin tone that you are aiming for. 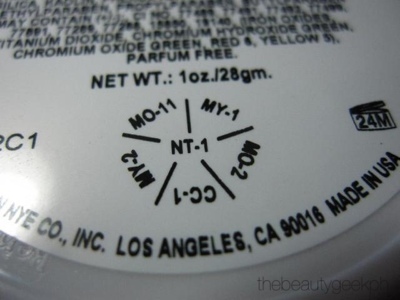 I haven't seen how deep each pan is, but it weighs 1 oz, which means it is packed with a lot of product. Hopefully I won't hit pan yet, but from the looks of it, it will take long before I get there, even with constant usage of this product. 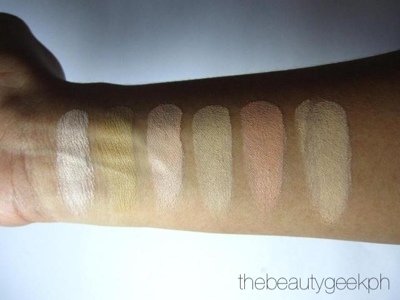 The shades of the concealer wheel is perfect for a lot of uses. 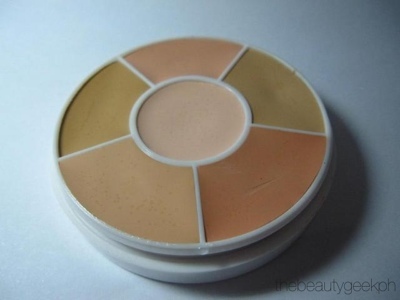 Aside from concealing, it is also perfect for highlighting. Ooops! I photographed the wheel the wrong way! Here's the name of each shade (from the top 'middle one' in clockwise direction) CC-1, MY-2, MO-11, MY-1, MO-2 and the middle one which is MO-1. How it looks like in natural lighting. It can get cakey on fine lines and for those who have dry skin. But a good moisturizer can cheat you with this one. You have to heat the concealer first if it gets stored in a cold temperature before using because it tends to solidify a little. It goes back to it's normal creamy consistency when you leave it in room temperature after. 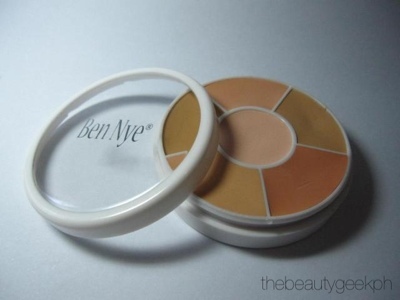 Buying Ben Nye cosmetics here in the Philippines isn't quite as accessible as other brands. Good thing for Make Up Pro, items like these are easier to purchase. And the good thing here is that all your make up needs is housed in one roof. No need to look around that much. Comes in 6 shades that you can mix together. Creamy consistency hence; great in blending. 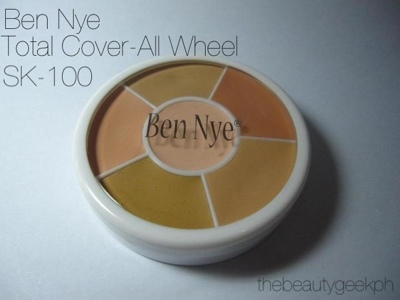 Very cheap, considering a pot of concealer would cost you half of this wheel, but with this one, you get 6 more shades amounting to an ounce of great coverage. Hides scars and marks well without looking patchy on the skin. IT COVERS WELL! THE VERDICT: 4/5 I would recommend this product especially for those who are just starting to build their makeup kit like me. 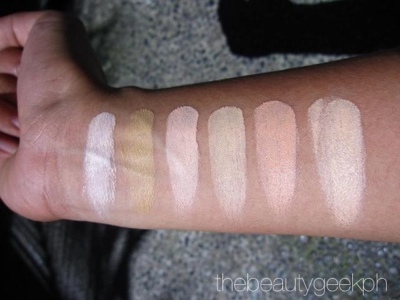 I did try several great concealers like MAC, Smashbox and MUFE and this product is at par with them. This is just based on my opinion. Hope it works well for you girls as much as it worked well with me. Great review dear. :) Followed you via GFC and Bloglovin. I hope you can follow back. :) See you in my blog. Thanks for the kind words Jenniya. I surely followed yours. Hey beauty geek, what happened? No more posts? I've just nominated you for the liebster award Katrina ♥ Hope you can check it out! Looks like a pretty good product - love the geek facts! Thanks for sharing this review. I'm on a lookout for a heavy duty concealer lately. Will consider getting this!